The North Devon Artist Residency was founded in 2018 and is open to artists in all media at all stages of their careers. Its aim is to create a cutting edge and innovative body of work inspired by and engaging with north Devon and the village of Combe Martin. NDAR is an artist residency based in the village of Combe Martin, north Devon, on the edge of Exmoor. The residency provides space for new work, for contemporary artists at any stage of their career. The residency was founded with the aim of stimulating contemporary and innovative work engaging with and inspired by Combe Martin and north Devon. Only artists with a genuinely cutting edge, high quality and innovative practice will be considered for this residency. Resident artists will have accommodation in a two-bedroom cottage in the village, and will work from the cottage. Residency applications which include a public or participatory event are very welcome, but are not an essential requirement. Artists can apply to live and work at the cottage for a month or less, and return stays can be arranged if required for the completion of a project. Successful applicants will need to fund their travel and living expenses, as well as any materials needed for their work. They will need to have a strong element of self-reliance, as there is no artist community in the village, and the resident artist will be alone in the cottage. However, artists may apply with a colleague, and, under agreed circumstances, with family members. The cottage is for the sole use of the resident artist, and the artist will have sole use of a bedroom, kitchen, bathroom, living room and garden. 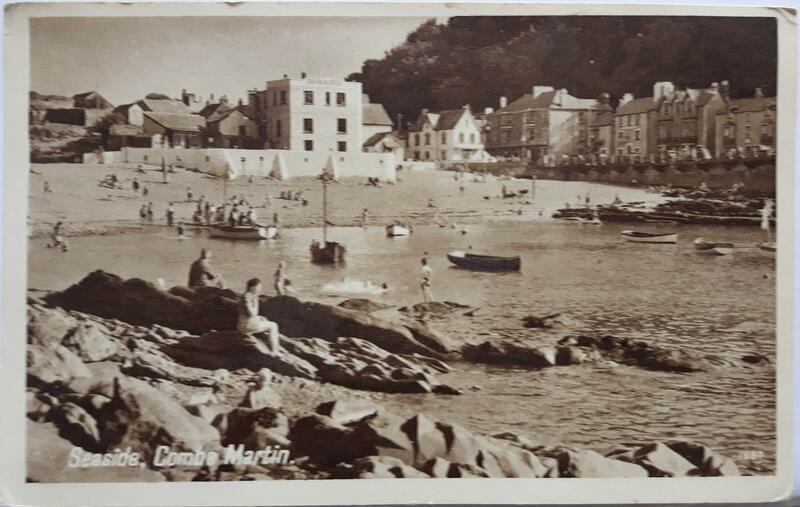 Combe Martin is a large village with good amenities, including four pubs, food shops, post office, pharmacy, garage, folk club, parish church with medieval rood screen, beach and tourist information. It has the longest village high street in England, and has a wealth of history and folk culture, including silver mining, strawberry growing, the Earl of Rhone festival and an annual carnival. In nearby Ilfracombe, the harbour is home to Damien Hirst’s ‘Verity’ sculpture and art gallery, and there are various quirky features in the town, such as the Victorian ‘tunnel’ beaches, and the haunted Chambercombe Manor. Further afield, there is a museum in Barnstaple, the Burton Art Gallery in Bideford and the Broomhill Sculpture Gardens in Muddiford. St Ann's Chapel in Saunton has an interesting collection of stained glass by Mary Lowndes, while Bideford has a connection with artists Judith Ackland and Mary Stella Edwards who had a home there. The village is served by buses only. The nearest rail stations are Barnstaple or Tiverton. Whilst not essential, a car is extremely useful if the project requires travel beyond the village. Artists will be required to make their own way to and from the residency. Please contact us if you have specific access needs so that we can give you detailed information about the accommodation. The aim of the residency is to create a serious, cutting edge and innovative collection of contemporary artworks inspired by and engaging with north Devon, and more particularly Combe Martin. In addition to the physical collection, we are keen to encourage documented participatory projects in the village. The emphasis of the residency as a whole is to create innovative and cutting edge works. Each resident artist will be required to donate one work created during/as a result of the residency to the collection. The first stage of the residency 2018-2019 will involve artists living and working in our cottage. We will be accepting proposals in media such as photography, film, text, performance, sound, music, poetry and engagement with the public. The selected artists' areas of interest can range from contemporary responses to the landscape, seascape, dark skies, geology, village architecture and archeology to engagement with the local economy and culture, plus anything in between. The second stage of the residency will involve the construction of a garden studio, and this will allow us to take proposals from painters, potters and other ‘wet’ media. As the residency establishes itself, we anticipate regular events which will develop links with local artists and galleries, as well as meetings for resident artists with local curators. The ultimate aim of the residency is to donate the works created to an appropriate art organisation, gallery or museum in north Devon. While the collection is being created, we aim to exhibit parts of the collection in venues in north Devon, as well as beyond. Artists are required to donate only one piece of work, although there might be a potential for artists to collaborate more extensively on an exhibition or display related to the collection, should they wish. Residencies normally take place between October and May, although there may be some flexibility around this. Residencies last up to one month, with the option of return by arrangement, if required for the completion of a project. Accommodation is in a comfortable, peaceful cottage with garden. All facilities are for the sole use of the artist - bedroom, bathroom, living room, use of TV, wifi, washing machine, dishwasher. Telephone and email advice, support and feedback is offered, as well as introductions to local arts organisations and curators as the residency develops. Travel and transport costs, food and supplies, art/fabrication materials are NOT included. Resident artists will be required to donate one artwork created during or as a result of the residency. Multiples will be editioned and accompanied by a certificate of authenticity. Works such as film or performance will be required to include a credit for the residency. NDAR will endeavour to exhibit and promote donated artworks within the framework of the North Devon Artist Residency collection, where and when possible. Resident artists will be required to document their residency in a mutually agreed format. Artists will be required to respect the peace, quiet and rules of the cottage and its neighbours. Access for those with mobility difficulties may be difficult. There are two steps to the front door; the bathroom is upstairs, although there is an outdoor toilet, one step down from the kitchen. The living accommodation is upstairs. The main part of the garden is up a flight of steps. There is no parking directly outside the cottage. Please contact us for specific details. Each artist residency will be documented on our website. We have a dedicated facebook and Instagram page. As the residency develops, we plan to develop links with local arts organisations and galleries. We are looking for proposals by artists who can bring an innovative, cutting edge and contemporary response to a traditional working village in a beautiful and dramatic part of Devon. Because we are seeking to stimulate the creation of new artworks, we are keen to offer flexibility in terms of artists' particular needs e.g. short monthly visits over the space of a year might be more appropriate to the production of an artwork than a single month of residency etc. When can I undertake my residency? Residencies are usually undertaken in the months October to May. There is flexibility around this, and if we are interested in your proposal, we will try to accommodate you in agreeing a date for your residency.